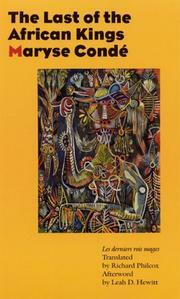  The Last Of The African Kings ($35.00; paper $12.00; Nov. 30; 216 pp. ; 0-8032-1489-8; paper 0-8032-6384-8): This latest (1992) of Guadeloupean CondÇ's several chronicles of native Africa's encounter with the modern world is, like such predecessors as Segu (1987) and Tree of Life (1992), impassioned, impressively detailed, and a bit too schematic to fully engage a reader's sympathies. In tracing the dispersal of a noble African family who scatter in exile throughout the US and Caribbean, CondÇ ironically contrasts the enervated life of Spero Jules-Juliette, a painter unhappily married to a black American academic, to both their daughter's journey to Africa in search of her origins and to the more heroic trials endured by Spero's ancestors. But the parallels are labored, and the characters never come to life. CondÇ has essentially written this novel before, and undoubtedly will do so again.